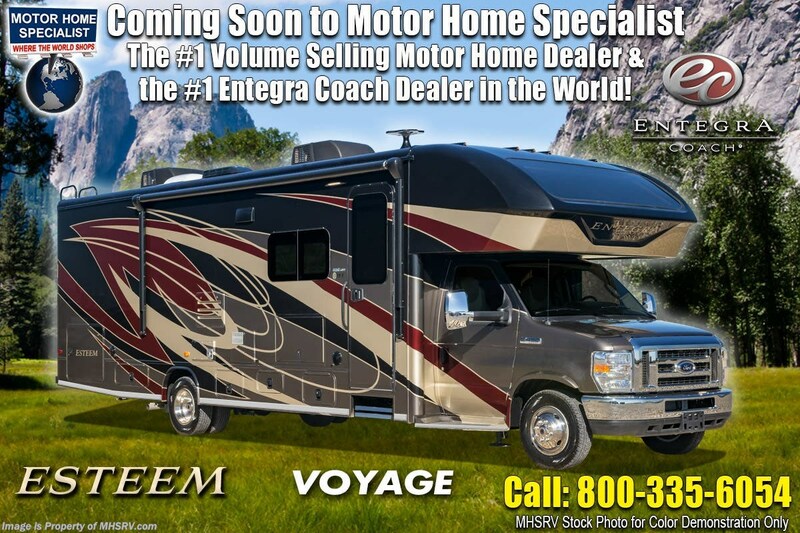 Motor Home Specialist is the #1 Volume Selling Motor Home Dealership in the World. Over $165 Million Dollars to Choose From. New RVs from $19,999 Travel Trailers to Over $2MM Bus Conversions and Every Type & Price-Point in-between! No Games. No Gimmicks. 25% OFF or MORE on Every Make and Every Model&apos;s M.S.R.P Everyday! Visit MHSRV.com or Call 800-335-6054.<br />MSRP $147,549. The Ultimate in Compact Luxury Motor Homes is Here! 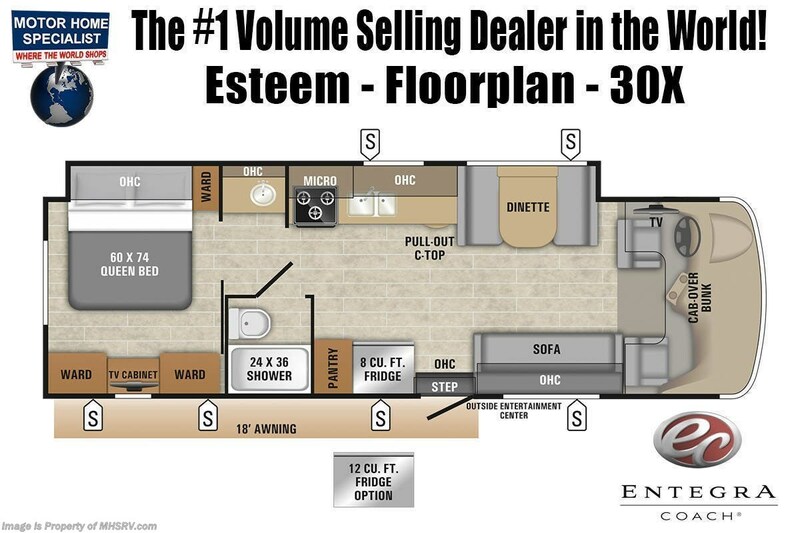 Introducing the all new 2019 Entegra Coach Esteem. Until now, Entegra Coach has built only high-line luxury diesel pusher motor coaches with price tags that could easily exceed $750,000! Now for the first time you and your family can enjoy the exceptional craftsmanship, premier drive and even Entegra Coach&apos;s industry leading 2-Year Limited, 5-Year Structural, Transferable Warranty! The 30X measures approximately 32 feet 6 inches in length. Options on this unit include the beautiful full body paint exterior, aluminum rims, an extra large refrigerator and (2) roof A/C units! Entegra Coach prides itself as having the "quietest riding, best handling luxury diesels on the market today" and the all new Entegra Coach Esteem is following in those very footsteps. The exclusive E-Ride LX Handling Package found in the Esteem boast a computer-balanced driveshaft, an oversized stabilizing bar, Bilstein shocks, rubber isolation mounts and Hellwig L-35 helper springs for incomparable drivability. You will also enjoy having a 7,500lb. hitch! The Entegra is the only class C on the market to minimize "road fatigue" through construction and materials. The standard features list is nothing short of extraordinary including a Sony Infotainment System, a one-piece seamless molded fiberglass front cap with fiberglass wings, an automotive and bonded panoramic front window with power black-out interior shade and a full aluminum front cab-over cage for superior strength and coach integrity. Additional construction and feature highlights include a one-piece fiberglass roof, frameless and tinted windows, an Onan MicroQuiet™ generator, total in-house water filtration system, a dream dinette™, a full cab-over bunk with an incredible 750-lb. rating, automotive design ABS molded front sleeper compartment with integrated cup holders, cab-over entertainment center, bedroom TV, pillow top mattress, day/night roller shades, stainless steel appliances, a 1000 watt inverter, automatic one touch leveling, solid hardwood cabinet doors with hidden hinges, full extension drawer guides, frame mounted seatbelts (sofa and both dinette benches), residential full vinyl flooring with no ducts (all ducts installed in toe kicks), stainless exterior trim package, solid surface kitchen counter and slide-out counter extension in select floor plans, solid surface sink covers, chrome exterior mirrors with integrated side-view cameras, extra large fiberglass running boards and TuffShell™ vacuum bonded lamination process in sidewalls, roof, and floor. The R-7 high density bead foam insulation will keep the Entegra far better insulated and quieter inside as well. Electro-Galvanized Steel backers are utilized within the walls as anchor points for superior structural integrity. Structurwood™ Decking is utilized in the floors to eliminate creaking. Other unique features include thick insulated compartment doors, a slide-out battery tray, one-piece Roto-Cast baggage compartments, heat pads for holding tanks, a lighted step well with electric entrance steps, a power awning with LED light strip, a power driver&apos;s seat, energy efficient LED ceiling lights, fully ducted and even air flow throughout the coach and an Energy Management System. For more complete details on this unit and our entire inventory including brochures, window stickers, videos, photos, reviews & testimonials as well as additional information about Motor Home Specialist and our manufacturers please visit us at MHSRV.com or call 800-335-6054. At Motor Home Specialist, we DO NOT charge any prep or orientation fees like you will find at other dealerships. All sale prices include a 200-point inspection, interior & exterior wash, detail service and a fully automated high-pressure rain booth test and coach wash that is a standout service unlike that of any other in the industry. You will also receive a thorough coach orientation with an MHSRV technician, an RV Starter&apos;s kit, a night stay in our delivery park featuring landscaped and covered pads with full hook-ups and much more! Read thousands upon thousands of 5-Star Reviews at MHSRV.com and see what they had to say about their experience at Motor Home Specialist. Why Pay More? Why Settle for Less?